Happy Birthday on the 15th to blog follower Morag! Also on these two days: a Yorkshire gggg grandfather, an Aberdeenshire Watt who worked at the Cluny Hill Hydro, a Strachan great aunt who died age just one and a McCrae great uncle who died age 21. My gggg grandfather William Roydhouse or Roadhouse was probably the one baptised on 14 March 1762 at Darfield, Yorkshire, son of Samuel Roadhouse. He married at Darfield in July 1795 to Mary Adams, who was from Brodsworth, and they had 6 children baptised at Darfield. William appears to have died before 1837. His widow Mary is in the 1841 census living with her daughter Mary who had married carpenter George Senior and was living in Carlton. In 1851 William’s widow, age 79, was in Wombwell with her youngest daughter. Birth of Agnes Bruce Watt at Ellon, daughter of George Watt and Mary Mutch, and granddaughter of my gggg aunt Elizabeth Hutcheon and John Mutch. Agnes is with her family i 1871 at Ellon, her father an ag lab, can’t be located in 1881, but in 1891 is a nurse at the Cluny Hill Hydro Establishment at Forres, in Moray. This was quite a large enterprise in its day, where people went to recuperate from illness and “take the waters,” and on census night in 1891 had around 59 guests, a manager and 23 live-in servants. In 1893, however, Agnes married draper and widower William Cameron in Aberdeen, and in 1901 they are at Devonshire Road, Aberdeen, with 4 of William’s children, their own young child and a female servant. Agnes Bruce Cameron nee Watt died in Aberdeen in 1955 at the age of 91. Birth of my great aunt Margaret Strachan at Dykehead, Riccarton, Ayrshire, daughter of Joseph Strachan and Jeannie Haddow. Margaret died at just over 1 year old at Kenneth’s Row, Kilwinning, of a bowel complaint and consumption. Birth of my great uncle John McCrae at Kilmarnock, son of coal miner John McCrae and Mary Ann McAnairney. In 1881 he’s at Mill Lane, Kilmarnock with his parents and siblings but is not with his parents in 1891 and I cannot find him elsewhere: he may have been with his parents and missed off the form. He died in May 1897 at Kilmarnock Infirmary at the age of 24, from otitis media 3 months and meningitis 3 days, which indicates he had an ear infection which spread to the spinal chord. 10th February is my ggg grandfather Robert Marshall, a saddler of Kilmarnock. There was no-one on the 11th. On the 12th there were two Lamb cousin in Aberdeenshire, one of whom had illegitimate children and never married, and the other who went to England and became a public parks superintendent. Plus a Fraser who migrated to California and a McCrae who lived, worked and died in Kilmarnock. Baptism of my ggg grandfather Robert Marshall in Kilmarnock: at least think it’s the right Robert Marshall. The one baptised in 1761 was the son of Alexander Marshall, a brazier of Kilmarnock, and Agnes Gibson. A brazier was someone who made or repaired things made from brass. Evidence to support this being the correct Robert is that “my” Robert married Agnes Logan on 10 February 1792 in Kilmarnock, and they called their eldest son Alexander. Robert Marshall and Agnes had 11 children baptised in Kilmarnock, and the baptism entries give his occupation as saddler. Robert died before 1841, but his widow died in 1865 age 93, and her death certificate says she was the widow of Robert Marshall saddler. Baptism of Elizabeth Lamb at Longside, Aberdeenshire, daughter of my gggg aunt Elizabeth Hutcheon and John Lamb. Elizabeth was born illegitimate but her parents married in 1846, then her mother died in 1847. In 1851 Elizabeth is with her mother’s sister Margaret, who had married Charles Davidson, and her father is a farm overseer at a nearby farm. Elizabeth had an illegitimate daughter in 1863, the father not named. In 1871 Elizabeth is at Rora, Longside with her aunt Margaret, and her 7 year old daughter is in Longside with Elizabeth’s father and his second wife. Later in 1871 Elizabeth had an illegitimate son, again father not named. In 1881 Elizabeth’s 2 children are both at Rora with Elizabeth’s aunt Margaret while Elizabeth is working as a domestic servant in Peterhead. Baptism of Robert Lamb at Longside, Aberdeenshire, son of my gggg aunt Mary Hutcheon and Robert Lamb (and cousin of Elizabeth Lamb baptised on the same day) – his census entries all say he was born in Peterhead, and his parents were in Newseat, Peterhead in 1841. In 1851 he is with his family at Cuminstown, Monquhitter where his father was working as an ag lab. By 1861 his family had moved up to Rafford in Moray, and Robert is close by at Edinkilie, Moray working as an apprentice gardener. By 1871 he had moved to England and is at Waldron, Sussex working as a domestic gardener. The he married Ruth Stone in 1879 at Cheltenham, and in 1881 they are in Stockport, Cheshire with a baby daughter, Robert working as a gardener. In 1891 he is the head gardener working and living at Phillip’s Park near Prestwich, with his wife and daughter. By 1901 Robert is a superintendent of public parks, and in 1911 is still a superintendent of pubic parks, living at The Cottage, Heaton Park. He died there in 1914, after his wife had died, and probate of his will went to his daughter Mildred, who had married James Lamb, who may have been a relative. Birth of Samuel Fraser at Old Deer, son of my ggg uncle shoemaker William Fraser and Barbara Cordiner and grandson of William Fraser and Christian Hutcheon. In 1871 he’s with his parents and siblings at Kinknockie, old Deer, and in 1881 is a farm servant at Mains of Tarty, Logie Buchan. He migrated to USA not long afterwards, though I haven’t found him on a passenger list, and went to California. In 1894 he married Helen Andrews, who also had migrated from Scotland, and they are in the 1900 USA census in San Francisco with 2 children, Samuel working as a stationery engine fireman. He then seems to have acquired some land further up the coast, as in the 1910, 1920 and 1930 census he’s a farmer at Big River, Mendocino. Samuel and Helen had 3 children, and Samuel was buried at Little River, Mendocino in 1939. Birth of my great uncle Matthew McIncarne McCrae in Kilmarnock, son of John McCrae and Mary Ann Mcinairney. He is with his parents in Kilmarnock in 1871, 1881 and 1891, and became a coal miner like his father and brothers. In January 1895 he married mill worker Annie McCubbin at The Manse, Kilmarnock, and one of the witnesses was Matthew’s sister Helen, my grandmother, who signed herself as Nelly McCrae. |n 1901 Matthew, Annie and 2 children are at 41 High Street, Kilmarnock, a tenement building where Matthew’s brother William and family also lived. In 1911 Matthew and Annie were at 19 Boyd Street, Kilmarnock in a house with their 6 children and Annie’s sister. The Valuation Roll of 1915 shows Matt McCrae tenant of 15 Boyd Street, which was owned by Mars Catherine Bailey of Ayr. Matthew’s son John died in Russia in WW1. Matthew McCrae died in 1941 age 70, in Kilmarnock. Baptism of my gggg uncle William Roydhouse at Darfield, Yorkshire, son of William Roydhouse and Mary Adams of Wombwell – surname also written as Roadhouse and Roodhouse back then. I’m pretty sure he married Rebecca Iveson at Royston in 1822 and is described as a cordwainer (old term for shoemaker): one of the witnesses was Samuel Roadhouse and my William had a brother called Samuel plus in the later census, that William Roadhouse has a birth place of Wombwell. In 1841 Samuel and Rebecca are in Carlton, near Royston, William a shoemaker and they have 8 children with them: they had 9 altogether. William’s wife Rebecca died in 1845, and in 1851 William is an ag lab in Carlton with 6 children at home, the eldest unmarried daughters no doubt being the housekeepers. By 1851 William’s address is given as Carlton Green and he has 3 grown up and unmarried daughters with him. He died in 1861 at Carlton at 67 years old. William reminded me that I haven’t organised all my notes on my Roydhouse ancestors, and need to do so plus do a bit more research! Birth of Amelia Green at Kings Road, Chelsea, London (today a rather good address! ), daughter of my gggg uncle Samuel Green and his wife Mary: her father was a licensed victualler who had moved from Worbsrough to Berkshire and then to London. Amelia is with her family at City Road, London in 1841 and is working as a servant, age 14, in 1851 at York Place, Chelsea for a retired hatter. She has become a barmaid by 1891 on Kings Road, Chelsea, then married publican Edward Smith in 1862 at St Marylebone church. In 1871 they are living at South Street, Kensington with 3 children, Edward a grocer. Edward died in 1875, and widow Amelia is still in Kensington in 1881 with 2 of her children. By 1891 she is in Camberwell, still with 2 children and living in the same building as her married daughter. By 1901 she has set up in business as a dyer on the ground floor of Addison Mansions in Hammersmith, and has a unmarried daughter with her and an older sister visiting. Her unmarried daughter died in 1902 and Amelia is in Camberwell in 1911, near where her married son was in 1901, and has a married daughter Florence and married son Edward with her. However, her daughter Florence is also listed in the 1911 census with her husband and children in Manor Park, near Lewisham, and her married son Edward is also with his wife in Hampstead: they must have both just been visiting their mother on census night. There are too many Amelia Smith deaths in the London area with a similar birth year to know which one is the right one. Birth of Alexander Milne at Cruden, Aberdeenshire, illegitimate son of my ggg aunt Janet aka Jessie Fraser and William Milne. He is at Mosside Croft in 1861 with his Fraser grandparents, his mother, an aunt and uncle, and his siblings and a cousin. By 1871 he was working as a farm servant but was only across the field at Hardslacks, working for farmer George Hutcheon. Alexander married Elizabeth Thomson at Craighead, Cruden in December 1880 and by then has become a blacksmith. They are at Hobshill, Cruden in 1881 and in Hatton in 1891, with 3 children and an apprentice blacksmith. They remained in Hatton, where they brought up their family of 9 children, plus seem to have always had an apprentice living with them. Alexander Milne died in 1920 of syncope: he dropped down dead near the saddler’s shop at the age of 60. Birth of Mary Logan at Belhelvie, Aberdeenshire, daughter of my ggg uncle James Logan and Jane Norrie. She is with her parents at Blackhil of Courtstone in 1871 where he father was a ag lab, and in 1881 is at Braiklay, Tarves living in as a cook on a 160 acre farm employing 7 farm servants. She married William Yule at Tarves in 1882, and by 1891 they are living at Newhills, Aberdeen, William working as a carter, and have 4 children. They are still in Newhills in 1901, with another 3 children and William a road labourer. Mary Yule nee Logan died in 1939 at Newhills. Birth of John Strachan at Kilmaurs, Ayrshire, son of John Strachan and Elizabeth Gilmour and grandson of my gggg uncle Samuel Strachan and Ann Miller. He stayed in Kilmaurs all his life, even living in the same row of cottages as his parents, and was a coal miner and then a railway guard. He is with his parents in 1871 and 1881, and in 1881 married Elizabeth Nisbet Lindsay at Kilmaurs, who given her name may well have been a relative, as Strachan married Nisbets and Lindsays. They are in Crawfordhill Cottages, Kilmaurs in 1891 with 2 children: Crawfordhill is by Thornton Colliery, just to the west of Crosshouse, so many of John’s relatives would have lived close by. John’s son James died in 1891 and in 1892 his wife Elizabeth died. He remarried in 1894, to Martha Boyd of Kilwinning, and they are Crawfordhill in 1901, with two more children. By then John was working as a railway guard. John Strachan died age 62 at Kilmaurs in 1924. William Marshall McCrae was born in Kilmarnock in 1914, son of my great uncle Matthew McIncarne McCrae and Ann McCubbin. He joined the Royal Engineers in 1939, and in 1943 married Ina in Deptford, London, though they set up home at Dean Street, Kilmarnock. Sapper William M McCrae was killed in action in Europe on 26 December 1945. You all love photos so here’s one of a McCrae descendant. Robert McCubbin McCrae was born in Kilmarnock in 1910, and was the grandson of my great grandparents John McCrae and Mary Ann McInairney. His father was Matthew McIncarne McCrae (no two people spell what I suspect is McInerney the same way!) who married Anne McCubbin: Robert McCubbin McCrae was the second youngest out of their seven children. 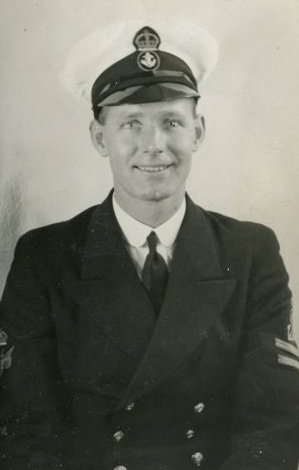 He is responsible there being a London branch of our McCrae family, as he served in the navy and married at Islingston in 1938. They lived in Putney, and Robert’s 1975 death was registered at West Ham. A big thank you to his son Robert who still lives in London and has given me permission to put the photo on my blog. Robert went cycling in the Outer Hebrides this summer so is clearly both fit and brave. We share the frustrations of researching the McCrae and McInerney family trees.